O’Callaghan, Business Development Director at JC Leisure. 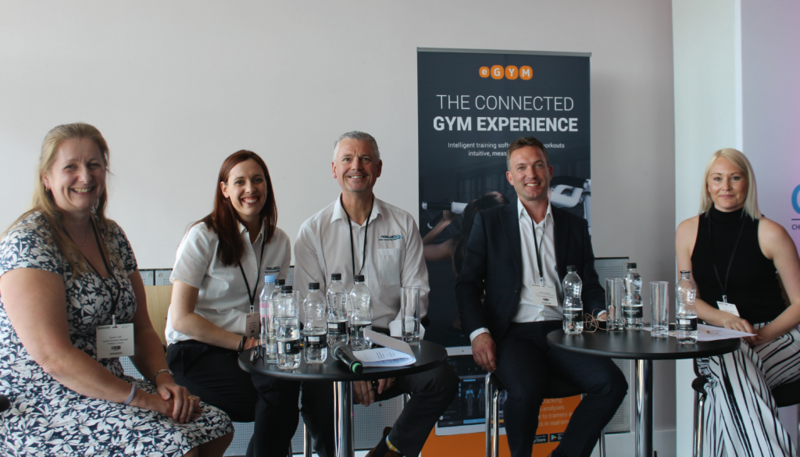 Lively, well-attended seminars at this year’s Elevate show at London’s Excel included a thought-provoking talk by ‘blended’ lifeguarding specialists, Pool View, on balancing the role of technology for the benefit of staff and users of public swimming pools. A self-confessed ‘early adopter’ Robin McGloughlin of Poolview said it has taken many years of knocking on doors for ‘below water’ technology to become an overnight success. “In 2011, we installed two Pool View systems, followed by three in 2012 and eight in 2013,” Robin told Elevate17 delegates. “In 2017, we will hit 52 installs; that is the equivalent of one installation every week.” Having been involved in a tragic incident while working at a pool in his native Eire, Robin has been a trailblazer for the introduction of assisted technology to support lifeguards. “One of my aims is to prevent the crap that I went through with an incident that still lives with me today,” Robin shared. “My job is not to get rid of lifeguards, the technology I am working with is to help lifeguards. “Technology is here to stay,” Robin said. “It will get better and better; costs will come down and safety will get better and better as a result,” he added urging public pool operators to take technology on board. Helen Meckiffe works for a multi-venue leisure operator, Pool People, that has integrated Pool View into many of its pools. “We would all welcome the opportunity to sit down with architects, designers and clients to influence the way pools are being built,” Helen told delegates. “But the truth is that the ideal pool just does not exist. “Pools come in all shapes and sizes with hazards such as window glare, down lighting and free form areas. NEUTRALISING HAZARDS : “What Pool View provides does is neutralise those hazards offering 100% visibility whatever the conditions,” she continued. “I am an advocate of lifeguard, I am not saying get rid of lifeguards but Poolview allows you to be a little bit more creative as regards programming,” “Poolview won’t raise an alarm, call an ambulance or rescue someone from a pool,” she added. “But you could reduce your lifeguarding resource, for programmes such as an aqua exercise class; where you can reasonably cut down to one lifeguard in addition to the instructor because you have additional control measures.” Helen recalled a recent incident when a swimmer at one of her pools suffered a seizure while in the water. “Having read witness statements with a critical eye, the Poolview system not only endorsed what had been said but showed the lifeguards had done even more than they remembered,” emphasised Helen who supports the Pool View system that she believes has a significant role to play in the recruitment and retention of modern lifeguards. Helen and Robin were taking part in one of the seminars organised as part of Elevate at London’s Excel arena, The full Elevate 2017 programme is divided into four seminar streams which take place in the gallery rooms, and three presentation areas on the exhibition floor. 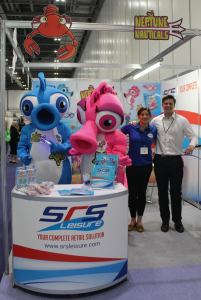 A cluster of water leisure exhibitors at this year’s Elevate included swimming merchandise specialists SRS Leisure. MAXIMISING REVENUE : Damian Stevenson, Insight and Partnerships Director at Swim England (formerly ASA) chaired the presentation on Maximising Aquatics Revenue – increasing usage and managing costs. This seminar will explored how to successfully implement and market innovative aquatics programming for a range of users and provides a great experience for swimmers, while examining maintenance strategies and cost savings. Swimming is the most popular participation sport, with over 2.5 million adults swimming weekly, yet swimming pools across the nation are not being used to their full potential. Pools are expensive to maintain, manage, staff and program, therefore optimising pool usage and cost saving strategies are vital. Damian’s team have been fundamental in rolling out behavioural insights that have led to the development of enhanced customer experiences across many parts of the aquatics sector. These experiences are designed to build a strong sense of achievement and satisfaction amongst existing swimmers, whilst encouraging ‘non-swimmers’ to re-discover their love of splashing about in water! Alyson Zell, Aquatic Business Manager at Freedom Leisure picked up the baton with an insight into optimising pool usage across 42 pools – through innovative programming, marketing and customer experience There was also a talk by Martin Symcox, Director of IQL UK and Water Safety Management at Royal Life Saving Society UK while Nicole O’Callaghan, Business Development Director at JC Leisure urged pool operators to focus on effective maintenance strategies – planned maintenance, energy management and staff training.